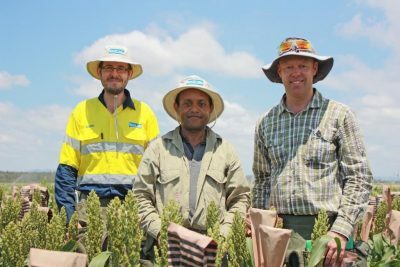 PACIFIC Seeds, the University of Queensland and Queensland’s Department of Agriculture and Fisheries have together received $605,000 from the Australian Research Council for a project to look into identifying sorghum genes with improved heat tolerance, and incorporating them into new varieties. Leighton Hight, Solomon Fekybelu and Wayne Chesher are part of Pacific Seeds’ sorghum-research team. The project seeks to bolster sorghum yields in a warming climate, which Pacific Seeds managing director, Barry Croker, said was a major problem in many sorghum-growing regions. “A recent study from the US showed that every degree centigrade increase in temperature can lead to 10 percent yield reduction in sorghum,” Mr Croker said. Mr Croker said the project’s findings had the potential to make sorghum a profitable crop in a number of high-temperature regions in Australia where it was currently not considered as a viable crop. UQ director of plant science research and project leader, Graeme Hammer, said the increasing effect of higher temperatures on grain yield was of growing concern. “What is unique about this project is that it brings together multidisciplinary experts and tries to connect basic discovery and applied breeding works in one go, making the research process efficient both in terms of time and resource use,” Prof Hammer said. Mr Croker said the initial three-year research phase aimed to improve understanding of the basic genetics and physiology of heat-stress tolerance so principles developed could be extracted and pursued to improve heat tolerance in other crops including corn and wheat.